A 3D elastic part as shaft is a rotating part with one axis which can be connected to other shafts. 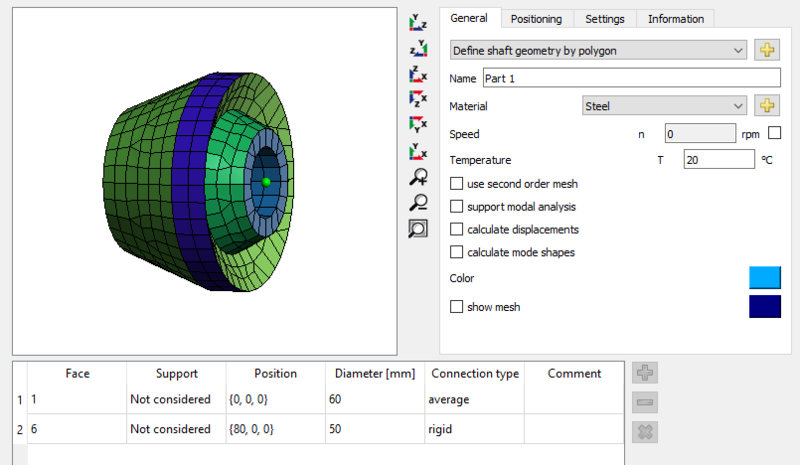 Currently, axisymmetric parts defined by a polygon or a STEP import can be considered. Using the -button behind “Define shaft geometry by polygon”, a dialog opens to define the geometry using a polygon. It should be defined clockwise. “x” is the axial coordinate, “y” the radius. Optional connections to normal shafts can be defined as “Considered as face” or “Considered as edge”. Either all points on a face or only points on an edge will be connected to a shaft support element. In addition, the mesh size can be defined in this dialog. 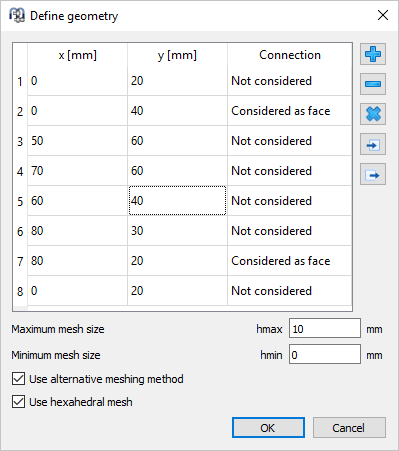 Additional settings are the material, the rotation speed, the option to select a second order (quadratic) mesh and the option if the displacements should be calculated. Using a quadratic mesh is recommended for better accuracy. The calculation of displacements increases the calculation time and would only improve the deformed shape in the 3D view. Under “Positioning” the axial position can be defined. In the table of the main view the support elements of the shafts have to be selected under “Support”. The connection type “rigid” enforces a rigid connection of the selected face/edge to the beam node of the shaft. The connection type “average” enforces an averaged connection to the node, which leads to less stiffening of the 3D elastic part. In case of a STEP import faces can be selected by double click in the 3D-view. Faces can be merged by selecting two faces, marking them in the table and selecting "Merge faces" in the context menu (right mouse button). Only neighbouring faces can be merged. For an imported shaft the x-axis must be the rotation axis. Under Positioning the orientation can be changed selecting "Permanent coordinate transformation". If faces are inside the part a clipping of front faces can be activated using the context menu in the 3D-view. Using Alt-Button and left mouse button the clip-plane can be moved.